Look over there to the right. 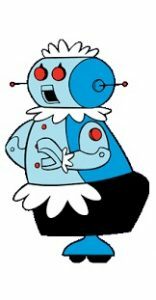 Recognize Rosie, the futuristic maid that cleaned up after the Jetsons on TV in the early 60s? She may have been before your time - although the Jetsons are probably still on in syndication somewhere - so perhaps a vision of Star Wars' R2D2, which first appeared in 1977, might be more relevant. Each of these media creations, and many more like them, hinted that robots are in our future. But even today, with Alexa and Siri now responding to our commands, the concept of autonomous roaming robots performing basic household tasks or acting as co-pilots aboard X-Wing fighters still seems to be years away. But it may be coming sooner than you think - especially in your casino. Knightscope, based in Silicon Valley, began developing security robots in 2013, shortly after the Sandy Hook Elementary school shooting in Newton, MA. Co-founder Stacy Stephens, himself a former police officer, was moved by this particular event, since it hammered home to him the message that it could happen anywhere. No one can deny that the modern history of the slot machine is one of imitation. Good ideas developed by one slot manufacturer are copied, refurbished and reintroduced under another name by other manufacturers. It's one reason slot-machine patent litigation is a career path for lawyers. However, even discounting alleged patent infringements, a good idea is a good idea. For slot machines, those ideas eventually are found in the games of many different manufacturers. Sometimes, they are changed enough so as not to infringe on patents, or the idea is so generic as to not be patentable. Other times, they are licensed from the patent owners until the patents expire. If you've been in management for more than a few years, you've probably sat through your share of "leadership" development programs, ranging from seminars to workshops. Some are required, such as the ones dealing with labor relations, harassment, safety and problem gaming. Others focus on team building, personality assessments and communication techniques. I have always enjoyed these types of sessions, even though many are repetitive, because they can force concepts that have become rusty back to top-of-mind. The same goes for trade magazine articles and the good books from the Business section. I'm sure that the sum of all these inputs over the years have had some subconscious impact on my skillset (or lack thereof). But recently, I tried to rank the importance of each of these in terms of my success or failures. It wasn't easy, since I've forgotten much more than I remembered. But a few stood out. At the Casino Marketing & Technology Conference you will be immersed in all aspects of gaming promotions and marketing initiatives including the latest technical innovations and advances that support casino marketing goals with technology. Learn real world solutions, gain a competitive advantage and make the right connections at this one of a kind event. Clarion Gaming has announced the launch of iGB Live! a new consolidated event which will feature leading brands, iGaming Super Show, EiG, and the Amsterdam Affiliate Conference, each of which will retain its own dedicated presence and brand personality. The creation of iGB Live! is part of the commitment made by Clarion to streamline the events calendar and provide stakeholders with a unique opportunity to engage across the entire igaming space at a single event. Event Director Shona O'Donnell, who was responsible for bringing the iGaming Super Show to market eight years ago and has overseen its development, believes the rebranding is timely and sees the creation of iGB Live! as a key initiative which will benefit all sectors and stakeholders.